The FoodSwitch mobile App empowers consumers to make better food choices by providing simple health information on a scanned product and suggesting healthier alternatives to 'switch' to. The App also asks consumers to help-out by crowd-source images on new products. In turn this helps our research and advocacy for improved food environments. ​FoodSwitch is a data-technology platform developed by The George Institute for Global Health to support the prevention of diet-related ill health around the world. Its goals are jointly to influence stakeholders across the food system to improve the food environment and also to empower individuals to make healthier food choices. Packaged food products often contain surprisingly high-levels of salt, sugar, saturated fat and kilojoules/calories which may contribute to diet related health risks such as heart disease and diabetes. However, the nutrition information on pack labels can be confusing and it can be difficult to choose between the different brands. The FoodSwitch App can help you find out what is in the food you’re buying and suggest healthier alternatives for you and your family. Making even small changes to our diets, such as consuming a little less salt and added sugar, and eating less fat (particularly saturated fat) and energy (kilojoules) could prevent many health problems including high blood pressure, high cholesterol, obesity and type 2 diabetes. This could in turn help reduce the incidence of heart attacks, strokes and some cancers. Starting in the supermarket aisle, the FoodSwitch App empowers you with access to information to help you make informed decisions about what you eat. By scanning a the barcode of a food item, FoodSwitch presents you with immediate, easy-to-understand information about that product’s nutritional make-up. Results are presented as either a simple 'Health Star Rating' which scores a food between 0.5 stars (least healthy) to 5 stars (healthiest), or as colour-coded 'traffic light' icons that show key nutrients as green (good), amber (so-so), and red (bad). FoodSwitch also presents a list of similar foods that are healthier alternatives. FoodSwitch works by using the phone camera to scan the barcode of a packaged food. It then uses science-based algorithms to calculate and then display simple nutrition profiles based on the nutrition content of the food. FoodSwitch comes with the core FoodSwitch filter and additionally other filters based on different health interests. Scan the barcode on a packaged food to get easy-to-understand nutritional information. 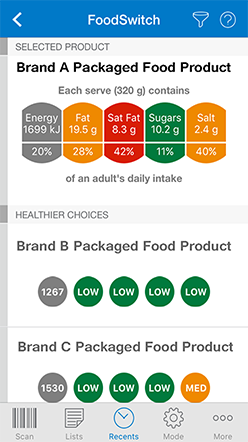 View results as either a Health Star Rating (HSR) or traffic-light coloured icons for key nutrients and energy. Both modes deliver results for energy, saturated fat, sugar, and salt so you can see at a glance how healthy the food item is. When you scan a food product you’ll also get a list of healthier choices you can switch to. The core FoodSwitch filter generates healthier choices by calculating the overall nutritional quality of foods. It uses the Health Star Rating algorithm to assess a range of different factors important to general health such as the amount of saturated fat, sugars, salt, energy, protein, dietary fibre, fruit, vegetables, nuts, legumes and for some products, calcium. In the SaltSwitch, EnergySwitch, FatSwitch or SugarSwitch filters, the algorithm adapts the results based on the amount of the relevant nutrient (e.g. salt for SaltSwitch). If you’re using GlutenSwitch, the healthier choices in GlutenSwitch include only gluten-free alternatives. Add an item to a shopping list, or report potential issues by simply swiping to the left or right of the screen for additional functions. This filter is great for anyone looking to make overall healthier food choices. This filter is great for people with, or being treated for, high blood pressure. It’s also useful for people with heart disease and kidney disease because it only lists healthier choices that have a lower amount of salt than the scanned product. This filter helps people living with coeliac disease or a gluten intolerance to identify gluten-free products. Likely gluten-free. This product is not marketed as gluten free but has no gluten-containing ingredients listed on the label. Gluten-free. This product is reported as gluten free by the manufacturer and/or is naturally gluten free. Please check the label. Unknown. This product has not yet been classified as gluten free or not and its gluten status is unknown. It also gives you gluten-free alternatives listed in order of how healthy they are. This filter has been designed for people with, or being treated for, high cholesterol. This filter only lists healthier choices that have a lower amount of saturated fat than the scanned product. This filter can help people choose foods with lower energy (kilojoules) to help manage their energy needs or reduce the KJ (Calories) they consume. This filter helps people choose healthier foods with less total sugar. Traffic Light icons show how key component of a food rates using colours - low (green), medium (amber) or high (red) for total fat, saturated fat, sugar and salt. Red is less healthy, Amber is OK and Green is a healthier choice. In Health Star Rating (HSR) mode, you’ll get an idea of how healthy a product is by a star rating from 0.5 to 5 stars. The higher the star rating, the healthier the food is overall. How do I understand the results if I’m viewing results in Health Star Rating mode? Each product you see in FoodSwitch has been rated for its amount of energy, saturated fat, sugar and salt, as well as for other important food components including protein, dietary fibre, fruit vegetables nuts and legumes (FVNL) content, and for some products, calcium. The Health Star Rating (HSR) considers all of these factors to give you an idea of how healthy the product is overall; a lower star rating indicates a less healthy choice and a higher star rating indicates a healthier choice. FoodSwitch is powered by a large, independent packaged food products database. However, because there are always new products coming on the market and some products are only available in certain areas, not all food products available in your country are in the database yet. This is why we encourage FoodSwitch users to help us add to the database using the “help us out” functionality. If you scan a packaged food product that isn’t in the database, you’ll be invited to help us out, by taking four photos – one of the barcode, one of the front of pack, one of the nutrition label and one of the ingredient list. FoodSwitch will then automatically email these pictures to us to validate the item and add it to the database. Every day there are new products appearing on supermarket shelves, and products being removed from the market. It is almost impossible to keep up with a rapidly changing food supply. There may be times when the app has listed an alternate product that is no longer available. We ask consumers and manufacturers to help us by using the “Report Issue” function in the app that allows information about an item to be sent, informing us it has been deleted or changed. Recording product availability across every supermarket in your country is not possible. Instead the app lists a number of healthier choices available in your country for the product scanned. If a healthier product listed is not available then your scanned item is the healthiest available at that location. The database is updated regularly by The George Institute for Global Health’s research team along with the help of FoodSwitch users who can send us feedback about products through the app, on the website, or by email at foodswitch@georgeinstitute.org.au. You’ll receive alerts from time to time when the database is updated and/or a new version of the app becomes available. Why are we using Australian based algorithms and UK based standards? How do we think these are applicable for global consumers? The health issues caused by packaged foods are basically the same irrespective of nationality. Excess quantities of salt, sugar, harmful fat and calories are a problem for everyone. We are using Australian based algorithms because they have undergone a lot of development. We will update the app using local government guidelines in the future if a need arises. Why should I be concerned about choosing healthy foods? Currently, packaged product nutritional information is mostly restricted to a nutrition information panel. This can be tricky to find, read and interpret, often making it difficult for consumers to be informed and make healthier food choices. Around the world, compulsory food composition labelling on packaged food products needs to include a nutrition label. This is often found on the back of the product in very small print. Studies show that the nutrition label only influences the food purchases of a small minority of people who are very motivated and well informed about how to make healthier food choices. Many studies suggest that front-of-pack (FoP) labelling systems can help consumers interpret the information and make healthier food choices. Why use Health Star Ratings? In June 2014, the Australian government agreed to the voluntary implementation of an interpretive ‘Health Star Rating’ (HSR) front-of-pack labelling system for packaged foods in Australia. The HSR System is based on an algorithm that awards a star rating, based on the quantity of specific food components within the product, which gives you an idea of how healthy the product is overall – a lower star rating indicates a less healthy choice and a higher star rating indicates a healthier choice. The HSR system then makes it easier for you to compare similar products within a food category, based on their number of stars. This highlights that while all foods can have a place in your diet, some are better for you than others. How can I tell if a food product is vegetarian? A vegetarian status is shown in all filters EXCEPT for the GlutenSwitch filter (note: GlutenSwitch is only applicable for some countries). If the manufacturer has labelled a product to be suitable for vegetarians, the product will be given a vegetarian status, indicated by the word "VEGETARIAN*" in green writing in the top right hand corner. Vegetarian healthier choices are identified by a green side bar. We advise you to always check the label. iPhone users: Download FoodSwitch from the App Store, either online or on your device. Android smartphone users: Download FoodSwitch from Google Play2, either online or on your Android smartphone. The app is free of charge. An internet connection (mobile data or Wi-Fi) is required to download it and to share information by social media and email. Standard usage charges may apply if using mobile data – check with your internet and mobile service providers for more information. Apple iPhone devices that run on iOS version 7.1 or later that have a camera with auto-focus. Please note: If you’re using a smartphone without a camera capable of auto-focus, FoodSwitch may not be compatible with your device. Without auto-focus, the pictures of the barcode will be blurry and FoodSwitch will be unable to identify the product. FoodSwitch is free and available to everyone in a FoodSwitch country who uses an Apple or Android smartphone that supports the FoodSwitch app! Can I use the app outside my country? FoodSwitch is designed specifically for each country and is different in each country in which it is released. This is because the barcodes on foods are specific to each country. For example, if you use the Australian version of FoodSwitch outside of Australia it will likely give incorrect results. We recommend that you consult your doctor or other qualified health professional if you have questions or concerns about your, or your family’s health.